Elegant striped parfaits make a festive holiday dessert that is gluten-free, dairy-free, and paleo-friendly–but no one can tell by looking! 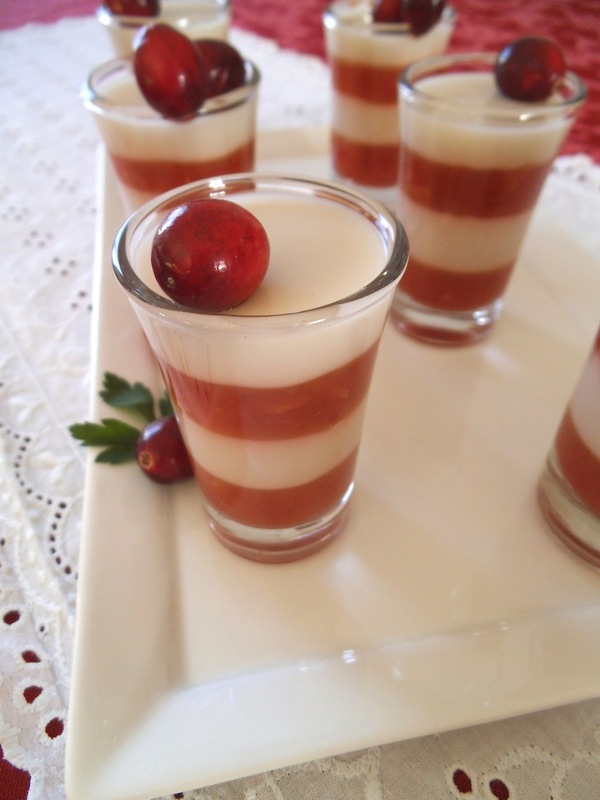 Cranberries colour the red layer, and coconut milk in the white panna cotta layers adds creamy richness. And the taste is perfectly sweet, thanks to a medley of fruit, a touch of coconut sugar, and pure honey. These parfaits are the ultimate make-ahead dessert. That means less stress on a day that you have company coming or are bringing food to a party. However, when you are in the kitchen preparing these, make sure to leave time for each layer to thicken until almost set. Don’t rush them, or your parfaits will not have neat layers. I learned this the hard way when making a larger gelatin “salad” for a potluck. Instead of a pretty layers of red and white, what I carried in was a pink, swirly conglomerate that tasted far better than it looked. Shot glasses are an advantage here, because they cool fairly quickly. So you can do some kitchen clean up or another project for about 20 minutes between each layer. And once the parfaits are assembled, they will keep nicely for several days in the refrigerator with the tops well wrapped. I tend to procrastinate, but preparing ahead helps nix holiday stress so we can fully enjoy the season! In a medium sauce pan, stir together diced pineapple, cranberries, and orange juice. Bring to a boil, stir, and then reduce heat and simmer with the lid on for 8 to 10 minutes, until fruit has softened*. Let cool before transferring to a blender. Blend until a red sauce forms, leaving some texture, or until smooth if you prefer. Meanwhile, into a small bowl, pour 1/2 cup cool water and then pour 1 packet of gelatin powder. Let the gelatin soften. Return the cranberry pineapple sauce to the pan, add coconut sugar, and bring the sauce to a simmer again. Turn off heat. Stir in the wet gelatin until completely dissolved. Transfer the mixture to another bowl and let cool to room temperature. Soften the other packet of gelatin by pouring it over 1/4 cup water. Scald 3/4 cup almond milk or dairy milk by heating it in the microwave or in a small sauce pan until almost boiling. Whisk together the hot milk and wet gelatin until the gelatin is completely dissolved. Then whisk in 1 cup coconut milk, honey, and almond extract until thoroughly blended. Let the white mixture cool to room temperature. Pour a layer of cranberry pineapple sauce into short clear glasses or shot glasses. Chill until almost set. Add a layer of white panna cotta sauce and chill again until almost set. Add another layer of cranberry pineapple sauce and chill again. Top with a final layer of white panna cotta sauce. Chill until all layers are set. If making the parfaits a day ahead, wrap the top of each glass with plastic wrap after they are completely cool. Serve the parfaits chilled, garnishing with additional fresh cranberries if desired. *Note: It is important to fully cook the fresh pineapple or the gelatin will not set. I’m bringing these parfaits to Fiesta Friday this week. Oh my word… these are absolutely gorgeous! Lovely idea to serve them in shot glasses. Thank you for bringing them to Fiesta Friday! It’s my pleasure. Thanks for stopping by! Have a lovely weekend! These are just too adorable and wonderful for the holiday season. Thanks for sharing these! I’m glad you think so! The parfaits are sweet without going over the top with decadence. They do blend well together. The sweet pineapple and tart cranberries balance one another. This looks so good….I am always looking for recipes to use my gelatin. (Found you on Savor Saturdays). Enjoy! I grew up eating jello salads at every potluck, but my kids think they are weird usually. They clamored for these parfaits though! They look absolutely amazing! You must be a very patient cook, with a steady hand to boot! These are so pretty! I think my children would just love these! I will definitely have to make these this Holiday season! Thanks, Shannon! I hope you enjoy them! This has been on my running list of recipes I want to makeover paleo-style.You’ve already done it here! Fabulous! Can’t wait to try. They are stunning. These are gorgeous Julia, and they look really yummy! I’m very impressed with your layers. Thanks, Michelle! It’s fun to breathe new life into classic recipes. I loved Jello as a kid, but am not such a fan of artificial ingredients these days. Those look delicious. Do you think I could sub the cranberries with strawberries? I have all the other ingredients on hand. Thanks for sharing this on Merry Monday. Pinned. Looks so festive and delicious! Yes, we certainly enjoyed them! Gorgeous and going on my Christmas menu! Featuring you on Savoring Saturdays! Thanks so much for linking up! These remind of of the Cat in the Hat! Yes, now that you mention it!